So you’ve made sure to have enough snacks, food, and creature comforts for your pet as your two embark on your trip. You’ve brought along some old toys and the car harness fits your dog perfectly or your cat’s carrier has a fluffy fleece pad in it. Now what? Well, maybe your pet isn’t the type who likes to travel. Maybe your pet would rather stay home and lounge on the couch, look out the window, and not leave the comfort of home but how would you know? They can’t tell us with words. We can’t always read their body language and sometimes they seem so excited to follow us to the car that it’s easy to think they love trips. In the car your pet doesn’t try to crawl onto your lap, pant, or cry with anxiety. They may settle down and nap or look out the window. When arriving at your destination, your pet doesn’t hide under the bed or in their carrier. Instead, your pet explores the new place, sniffing, watching, and listening to the new sounds. They may cautiously approach items and might be on edge but after a thorough inspection, they calm down and relax. Your pet eats. Some cats will not eat when they are scared and stressed. They will hide and sit in a corner, skipping meals. Some cats might eat at night when it’s very quiet. Dogs may stress eat and get an upset stomach but some may be so nervous and want to stick next to you that they forget to eat. When taking your dog outside to relieve him/herself the routine should feel the same. If your dog has a pattern of behavior when going potty, it should feel pretty much the same. Cats will use their litter box and the amount of urine and stool will be normal. All the good mannerisms your pet has at home should be present in a new place. They may be distracted and curious to meet new people, check out new places, but asking your dog to sit or stay should be ingrained. A cat, well, is a cat. But your cat should still come over for some affectionate pets and be ok and not hiding. Your pet should be about as vocal on vacation as s/he is at home. If your dog is fairly quiet and doesn’t alert bark much, then on a trip your dog may exhibit the same or similar behavior and be relaxed throughout the trip. Your cat should be fairly the same too and not howl or cry out of fear. Pets that are comfortable in their environment will act very much the same as they do at home with the exception of being curious and maybe a little more playful. Not all pets who like to travel will be exactly the same as they are at home. Some act even better while others get so distracted that they act up. A nervous dog’s body language will have subtle signs like ear placement and bigger signs like their tail between their legs. Cats may sit tightly and watch you but not come over or stretch out in a relaxed state. Their tail may twitch too and ears will be moving around picking up all the sounds. Pets tend to relax after the first night but some may relax right away. A cat I knew loved the car and would hop in, sit in the back and look out the window. Once she got to her vacation spot, she would walk on her leash and harness right into the place like she owned it. It was amazing. 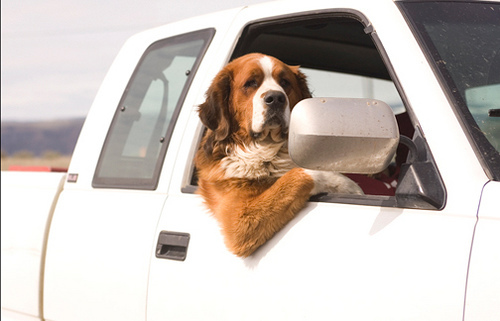 Do your pets like to travel? Share your stories!